• children younger than age 6 (safety and efficacy not established). ☞ Give by slow I.V. infusion. Average infusion rate is 100 units (2 to 3 ml)/minute; don't exceed 10 ml/minute. • If prescribed, administer hepatitis B vaccine before giving factor IX. • Know that dosage is highly individualized according to degree of factor IX deficiency, patient's weight, and bleeding severity. • Don't use glass syringe. Don't shake reconstituted solution or mix with other I.V. solutions. • Be aware that factor IX complex may transmit hepatitis. • Closely monitor vital signs during infusion. ☞ Observe for hemolytic reaction. If it occurs, stop infusion, flush line with saline solution, and notify prescriber immediately. • Monitor I.V. injection site closely. ☞ Monitor coagulation studies closely. Know that drug may cause thromboembolic disorders, including MI and DIC. • Inform patient that drug may transmit diseases. ☞ Tell patient to immediately report signs and symptoms of hypersensitivity reaction, including rash, hives, tightness in chest, wheezing, shortness of breath, and swelling of throat or lips. ☞ Advise patient to immediately report unusual bleeding or bruising. • Caution patient to avoid activities that can cause injury. • Tell patient to wear medical identification stating that he has a blood-clotting disorder. • Instruct patient to notify surgeon or dentist of his blood-clotting disorder before surgery or invasive dental procedures. in the clotting of blood, also known as: Christmas factor (Biggs and Macfarlane), plasma thromboplastin component (Aggeler), antihemophilic globulin B (Cramer), plasma thromboplastin factor B (Aggeler), plasma factor X (Shulman), antihemophilic factor B, and platelet cofactor II. Factor IX is required for the formation of intrinsic blood thromboplastin and affects the amount formed (rather than the rate). Its active form, factor IXa (EC 3.4.21.22) is a serine proteinase converting factor X to factor Xa by cleaving an arginine-isoleucine bond. Deficiency of factor IX causes hemophilia B. A protein substance in blood plasma that is essential for the clotting of blood. A deficiency of this factor is the cause of Christmas disease. a serine protease coagulation factor present in normal plasma but deficient from the blood of persons with hemophilia B. Factor IX forms a complex with its cofactor, factor VIII to activate factor X. Also called Christmas factor. Christmas factor, coagulation factor IX Hematology An intrinsic pathway factor which, when activated–IXa, combines with Factor VIII and a phospholipid to activate Factor X in the common pathway. 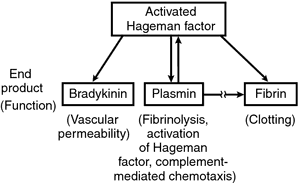 See Common pathway, Factor IX deficiency. In the clotting of blood, required for the formation of intrinsic blood thromboplastin; deficiency causes hemophilia B.
Synonym(s): antihemophilic globulin B, Christmas factor, plasma thromboplastin component. One of the many factors necessary for blood clotting. Absence of factor IX occurs as a result of an X-LINKED gene mutation and causes Christmas disease, a form of HAEMOPHILIA almost identical to factor VIII deficiency haemophilia. The drug is on the WHO official list. Human coagulation Factor IX is produced in freeze-dried form derived from donated blood under the brand names Mononine and Replenine. In blood clotting, also known as: Christmas factor and other designations; required for formation of intrinsic blood thromboplastin and affects the amount formed (rather than the rate).